We are excited to offer a first of it's kind FANUC CNC Retrofit Kit designed for simple, small-to-medium machine tools. These "Do-It-Yourself" retrofit kits are ideal for customers who have the chops to tackle the installation on straight-forward machines without accessories like tool changers, pallet changers, on-machine measurement devices, rotary tables, etc. For more dynamic CNC machine tools and grinders or machine tools that require mechanical repairs, we also offer turnkey FANUC retrofit and rebuild solutions. There are a number of other low-cost CNC Retrofit options on the market, but rarely are they designed with FANUC CNC hardware. FANUC CNCs offer the longest mean time between failure (MTBF) in the industry. Plus, comprehensive diagnostic and troubleshooting tools ensure a low mean time to repair (MTTR) in the unlikely event that an issue arises. FANUC CNCs also come with free lifetime tech support. Installation of a FANUC CNC Retrofit Kit starts by rewiring the I/O from the current cabinet to the I/O terminals in the new electrical enclosure. Motor mount adapter plates and couplings need to be designed and fabricated to adapt the new servo, and optional spindle, motors to the machine. Some troubleshooting and customization may be required to adapt the retrofit kit to your machine. 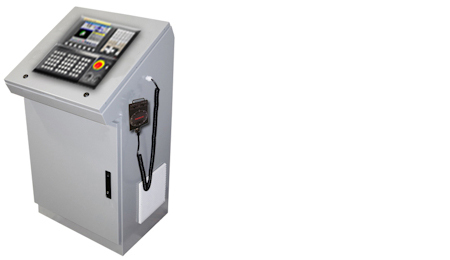 A standard mill or lathe PMC ladder logic program will be preloaded in the control. This will provide M codes and designated I/O options for peripheral systems like coolant systems, chip conveyors, work chucks, spindle gears, etc. NC Parameters for the servo motors, optional spindle motor, MDI panel, operators panel, and I/O will be preset and tested. Customers are responsible for providing specific machine details regarding gear ratios and ball screw specifications in order to configure the NC parameters for your machine. We recommend that customers start with the kit that best matches the machines current number of axes and motor sizes. All packages will be delivered within 6-8 weeks. One of our Sales Engineers will follow-up to review your retrofit.